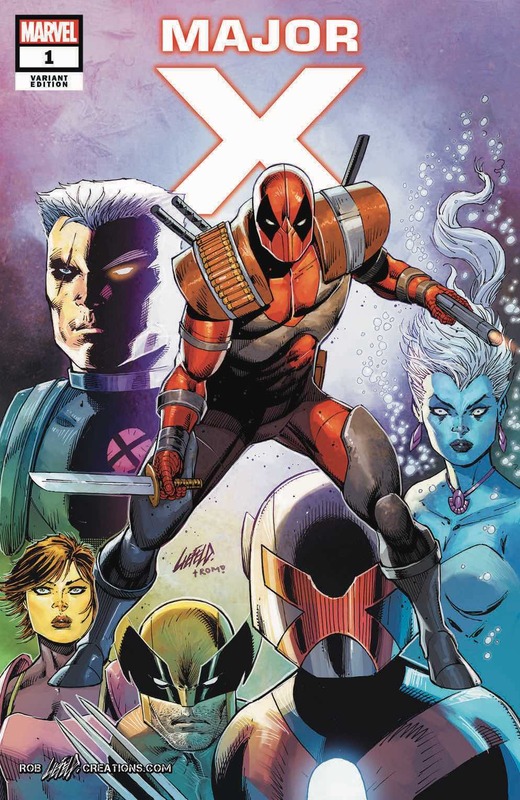 Rob Liefeld is attending AWESOME CON and he’s bringing the debut of MAJOR X with him! Come meet the creator of Cable, Deadpool, Domino, X-Force, Dove and his latest creation that has ignited the comic book scene MAJOR X! Rob will be appearing at AWESOME CON, April 27, Saturday only! We are offering an exclusive VIP PRIVATE EXPERIENCE package that includes the exclusive Deadpool #10 variants featuring the 1st published appearance of MAJOR X for this event as well as both our Major X #1 exclusive variants! The highlight of the Private Experience also includes a rare Major X Remarque on the cover of Major X #1. Rob Liefeld remarques are a rare commodity and Major X #1 is a book in high demand. Rob will also conduct a 60-minute interactive talk with the private experience participants. The Private Experience will be limited in capacity. 2 Signed Rob Liefeld Deadpool #10 variant comics! 2 Signed Rob Liefeld Major X #1 Variant comics! 1 signed Rob Liefeld Domino #1 Variant comic! Sold separately these items would total over $280.00, as part of this package, you are receiving a savings of $100.00! ***PLEASE NOTE – the Private Experience price DOES NOT include admission to the Awesome Con. Awesome Con Private Experience attendees are not eligible for the front of the line access without the purchase of this package. **** Packages MUST BE picked up by 2 PM on Saturday, April 27th. Unredeemed packages will not be mailed or refunded. Bring your email confirmation/receipt to the show to validate your package. You will pick up your package at the launch party. You can bring a copy of your receipt but we will have a list of all who purchased the Private Experience. Check your junk folder, sometimes our receipts end up there. Each package clearly states what is included. It is your responsibility to get there and pick up your package. We do not ship or refund.